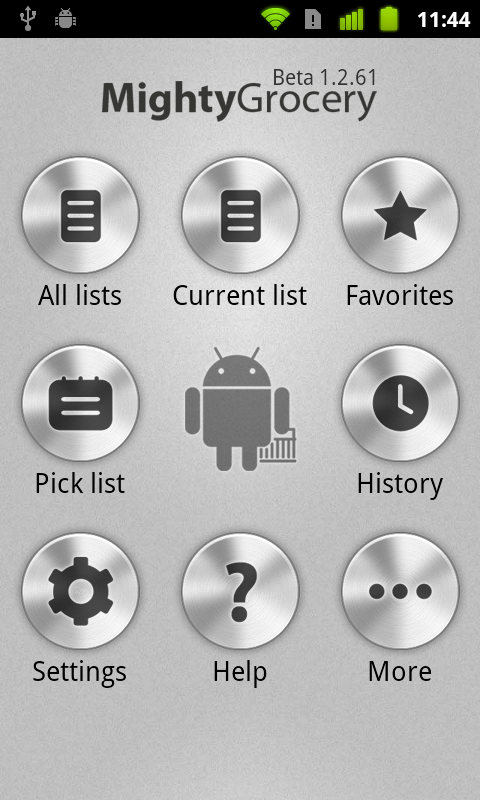 Navigation drawer is a new way to navigate through the app. 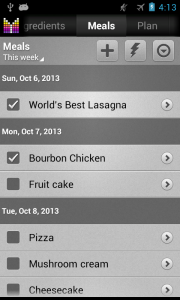 Meal planner: plan meals for upcoming week and see ingredients needed under Plan tab. Pantry improvements: Expiry date, Reorder Qty, pantry stock is only increased by purchased Qty, etc. 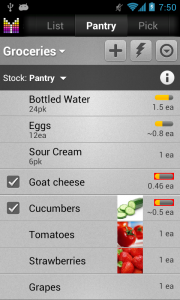 Pantry Manager helps tracking stock in your fridge. Todo lists with reminders. 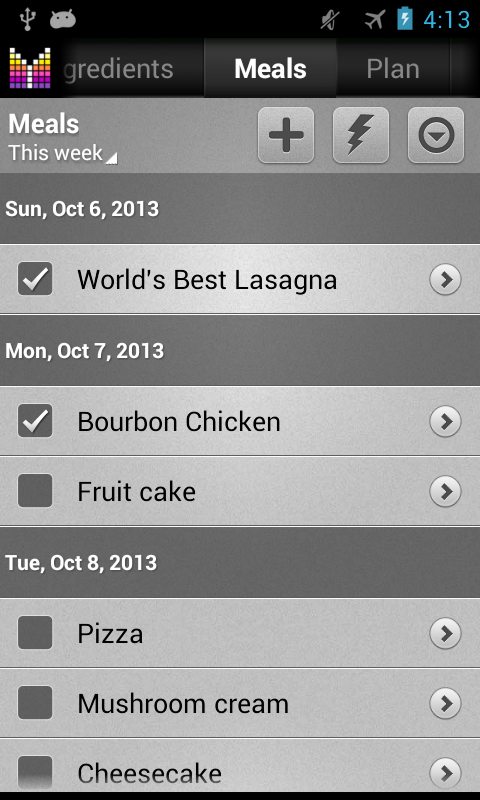 Now you can easily create task lists, checklists. 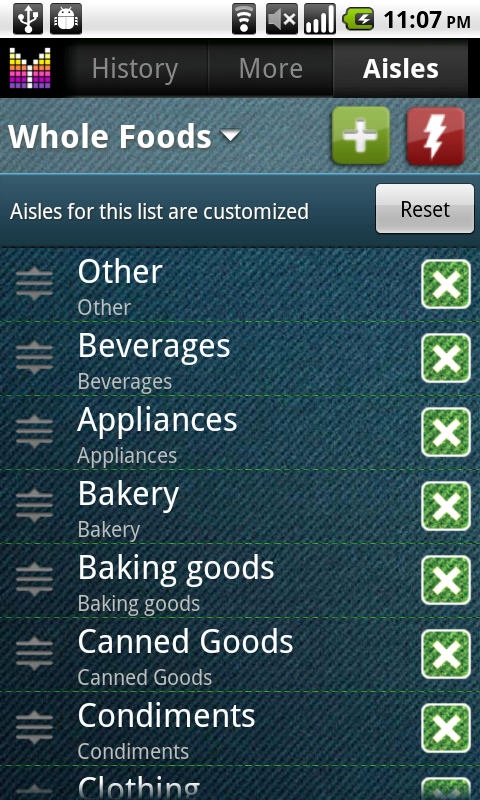 Copy items to multiple lists from shopping list, Edit item, Pantry (Long-tap item > Copy to). Package size in Price compare. Remove items with same name from other shopping lists on checkout. Auto Full Screen option (Settings > Options > Advanced > Auto Full screen). Reorder items manually. Drag-n-drop of items, lists, recipes, ingredients, products. Activate Edit mode and grab item on the right side to re-order. UI enhancement in Edit mode. Auto Full screen when rotating device into landscape mode. Configure Pick list UI enhancement: drag-drop, filter. Enhanced Settings > Options structure. Photos of items, shopping lists, recipes. Photos can be picked from gallery or taken with handset camera. Full version. Automatic backup and restore when you change handset or reinstall, the app will attempt to restore backup from Android’s Backup Service (Android 2.3+ and only if supported by device). Postpone items from shopping list until next checkout: long-tap –> Postpone. Postponed items can be listed under Side menu –> Filter –> Postponed. Store reward card number can be saved in list’s comment field or card barcode photo can be attached as photo to your list. 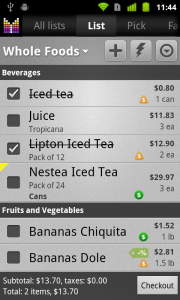 Text size option of item name, comments, price, and quantity in shopping list. 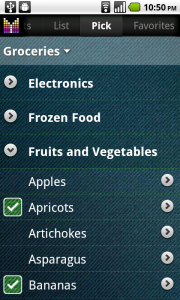 Show checkbox option allows you to hide checkbox in shopping list to have more real estate for item photo. 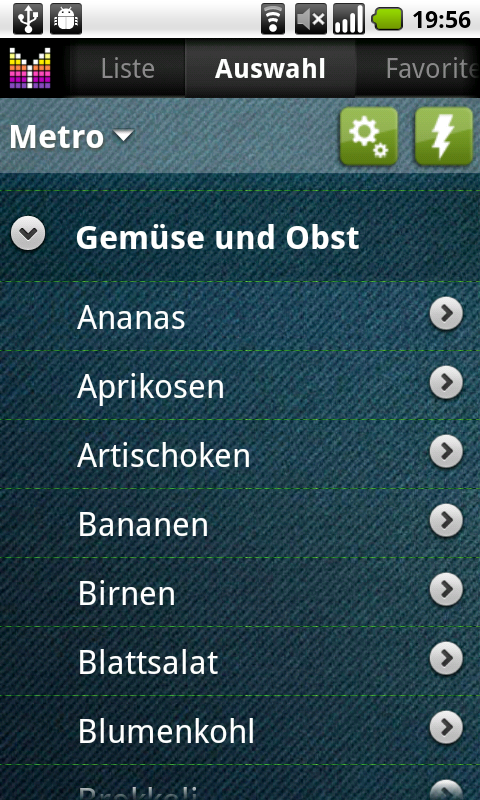 Language option allows changing application language independently from handset language setting. 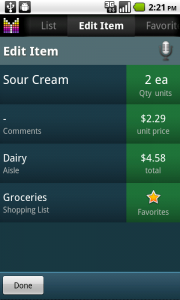 Select specific shopping list on Dashboard. 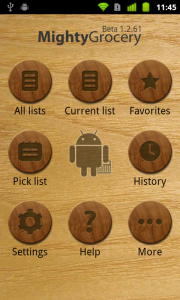 New Side menu: tap the Sidebar button to show all commands from toolbar and sidebar with icons and action names. Long-tap Side menu button to quickly show or hide sidebar. Easier access to Full screen: tap Side menu button, then select Full screen. Exit full screen from Side menu. Checkout button replaced with Side menu button in Full screen mode which gives access to all commands from sidebar in Full screen mode. Shopping list name displayed on the top in Full screen mode. New coupon types: Buy 1 get X free, Sale price, Simple indicator. 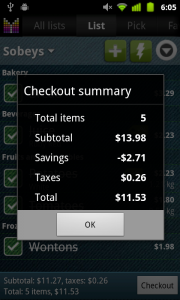 Ability to enter coupon comment which is also displayed in shopping list. 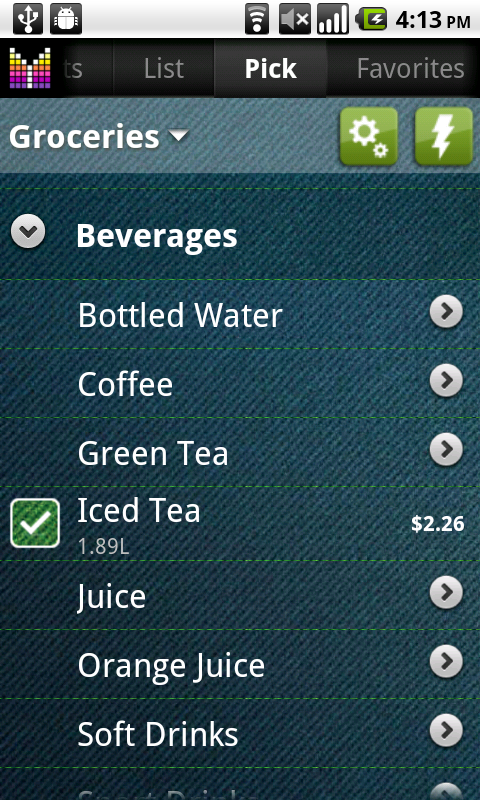 Smart tabs: invisible tabs such as Aisles will remain visible for a while in tabbar after they’ve been visited. This will make it easier to access rarely used tabs. Also, you can quickly switch to invisible tab by tapping → in the end of Tabs list. New dashboard with more buttons. Long-tap a button to change its function. Ability to make items taxable automatically. Tap the tax field and select “Set as default”. 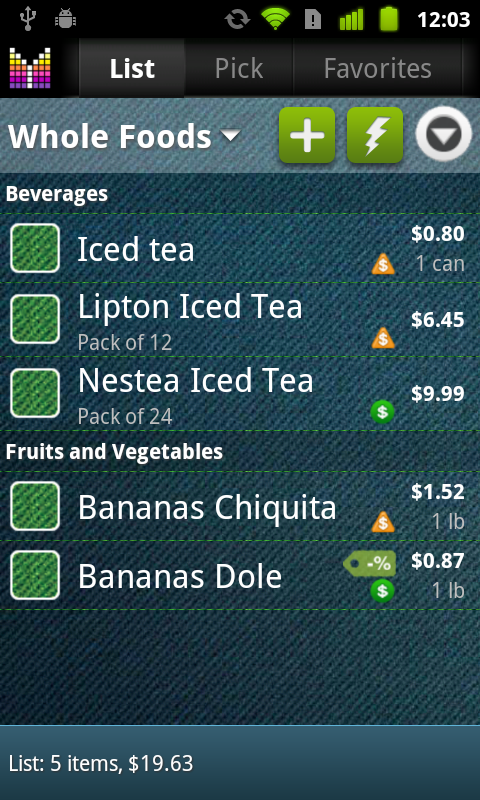 Show price compare options by long-tapping item in shopping list. Option: Hide price compare row. 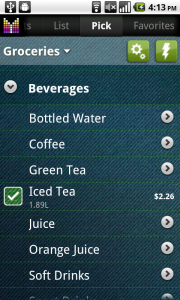 Option: Show generic name in shopping list. Confirmation before Delete All operations. You can still undo this action in Menu → Undo. Popup menu for barcode under Edit Item tab. Compare store prices for products. If product packaging is different, it will be possible to compare price per unified unit like ounce or 100 g. New propagation rules will allow assigning items to multiple stores/aisles without unlinking hassle. Full version only. Price history is available under Edit item tab –> Link button (top-left) –> Show price history. Show linked items is available under Edit item tab –> Link button (top-left) –> Show linked items. Link button (top-left of Edit item screen) shows popup menu. [Copy to] and [Move to] commands under Edit item screen → tap Shopping list field. Calculator is available when editing from price/quantity fields. ATM-style price entry option is available when editing prices. 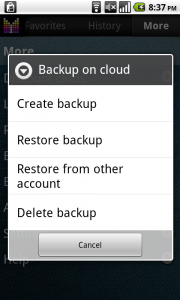 Disable Backup reminders option under More –> Backup on cloud. Disable Checkout summary option under Menu –> Settings –> Options. Changed propagation rules. Changes will be copied from items → favorites → products. Changes in products won’t propagate to favorites and items. qty=3 & total price = $10 will change total price to $9.99). New sources for barcodes: www.MyGofer.com, Google product search. Basic Web UI — is now available for anyone with Full version of Mighty Grocery. Just create an account, push your lists and start editing your lists online. Backup reminder — friendly reminder to create a backup, once a week. Email for account reminder — friendly reminder to assign email to your account if it’s not assigned yet. Restore password — if you have email assigned to your account, you can reset your password by entering your email or Account ID under Menu –> Settings –> Accounts –> Plus –> Restore password. Quick Navigation — Tap Android for quick navigation from home screen. Checkout summary — just tap on the summary bar in the bottom of shopping list or initiate checkout to see summary for checked items. 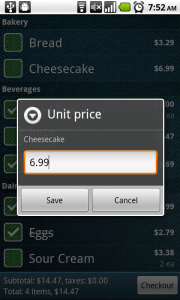 Multiply coupons by quantity (Amount per unit). 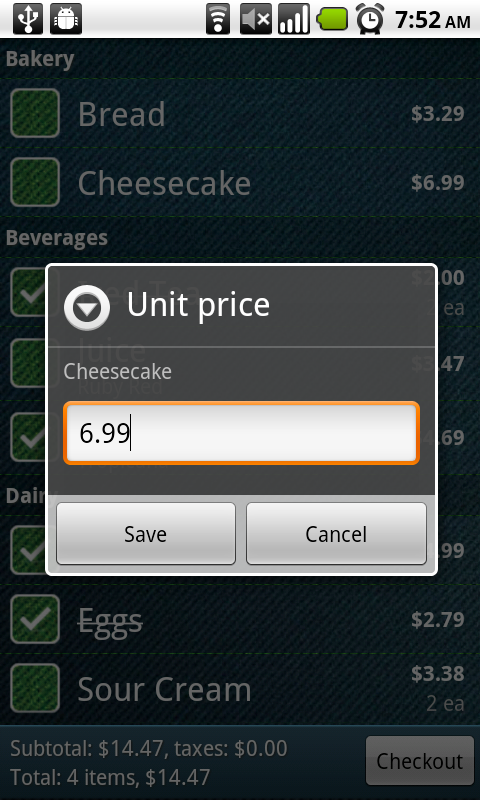 A new coupon type “Amount per unit” is offered when you add a coupon for an item. For instance, if you have $1 coupon and use the new coupon type, two boxes of Ice Cream $5 each will total $8 (=$10 – 2 * $1). In contrast, using “Fixed amount” coupon will give a total of $9 (=$10 – $1). Coupon expiry date appears in item’s comment under shopping list tab. Apply tax before discount — tap on Coupon/Discount field under Edit Item and tap “Apply tax before discount” to get tax applied before applying discount. 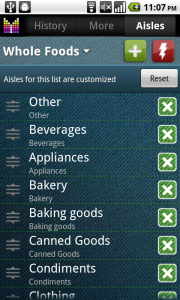 Search – allows finding your items by name in shopping lists, favorites, pick list, history, recipes. Edit items from Search tab or long-tap an item and choose “Show original” to open containing listing and navigate to selected item. 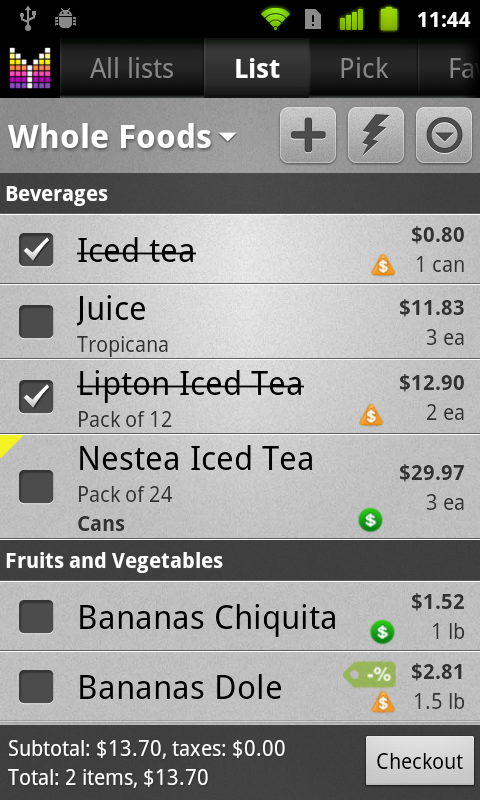 Better highlighting of a new item in shopping list. Only first word is Capitalized in Add box. 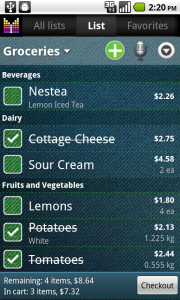 App Widget — allows quick access to preferable app screen and shows total remaining items. 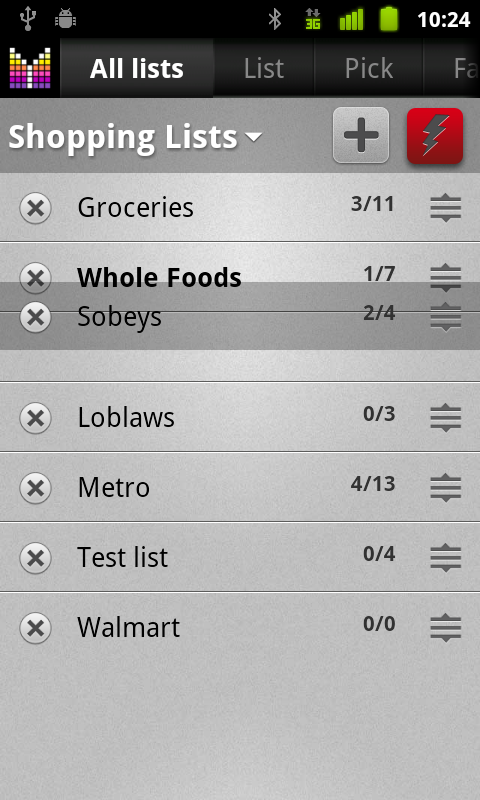 Long-tap phone’s desktop –> Widgets –> Mighty Grocery. Shortcuts — allows one-click navigation from phone’s home screen to Current list, Speech recognition, Favorites, etc. 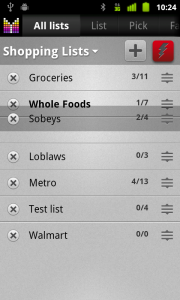 Long-tap phone’s desktop –> Shortcuts –> Mighty Grocery. Item tap action configuration option allows to configure action performed when item is tapped in the middle of a row. Toggle Full Screen mode when phone is shaken. Prompt for price when item is checked out using check-box. Details mode option needs to be ON in Menu –> Settings –> Options. Advanced Speech Recognition preferences: Menu –> Settings –> Options –> Speech recognition. App UI translated in Italian and Swedish! Fixed a few Force Close issues. Thanks again for sending reports! Fixed a few irritating Force Close issues. It would not be possible without your sending error reports. Thank you so much! 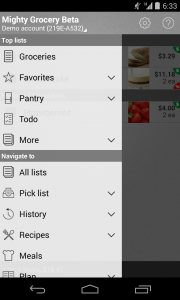 Disable Screen Rotation setting in shopping list. Default: off. Full version only. Checkout confirmation with long-tap and configuration option to switch between long/single tap. Put item in cart from Edit Item details screen. Recipe enhancements: ability to increase quantity of items on shopping list rather then removing existing item when clicking ingredient. Barcode scans enhancements: i) if scanned barcode already exists on shopping list, prompt either to set/clear check or edit item; ii) if scanning barcode from existing item and product has not been found, populate barcode fields with the item values. History: edit receipt name, date&time. Shopping list summary with subtotal and taxes which can be activated from Menu –> Settings –> Options –> Show subtotal summary. Cart tax is now calculated by the total sum rather then by the sum of individual items. Turkish and Finnish translations of product catalog. New error interceptor and ability to send us extended error reports. If the app ever encounters unexpected error it will prompt you if you want to send the error report via email. Please help us make the app error-free! Fixes for List Sync: i) idle force close & receive update; ii) infrequent stop sync due to lost connection. List Sync. Instantly sync changes in a shared shopping lists with all phones which have access to the shared shopping list. If your phone is powered by Froyo (Android 2.2), changes from cloud often arrive in a matter of seconds. Full version only. 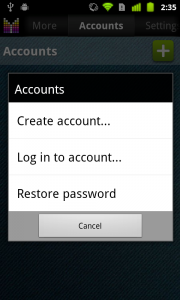 Note: Remember to set “Auto Sync” ON for accounts on your phones. 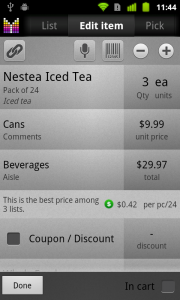 Coupon indicator for items in shopping list. Coupon value may be percent or fixed amount. Item price and shopping list total are adjusted by coupon value. Backup on cloud. Data is stored on the cloud and feature is available for all Android platforms. Full version only. More details in Sync with cloud User’s Guide. (Preview) Manual Lyst Sync. To give you a flavor of upcoming List Sync feature, we allow a simple Push/Pull synchronization with cloud. In this preview, a list can be pushed to or pulled from server as a whole, no simultaneous editing is allowed yet. However it is possible to create a list on one phone, push it to cloud and then pull it from cloud on a different phone. Full version only. More details in Sync with cloud User’s Guide. Better organized Settings. Options, Units, Manage Aisles, Accounts are now organized into single Settings page which is accessible from More page or by clicking phone’s Menu button. Previous Settings page is renamed to Options. More details in Settings User’s Guide. Reorganized Aisles. We’ve got lots of requests asking to allow deleting standard aisles and products. And we’ve heard you. From this release it will be possible to remove any products and aisles (except one system aisle). Moreover, any new aisle will be available in a specific list only (previously it would become available in all customized lists). Reorganized Pick list, from Settings –> Pick list it will be possible to take more control over your Pick list: delete presets, import your products & aisles, review automatically created items, and more. (Experimental) Import product catalog in German, Portuguese, Russian, Swedish, or paste your own catalog in CSV format. More details in Configure Pick list User’s Guide. 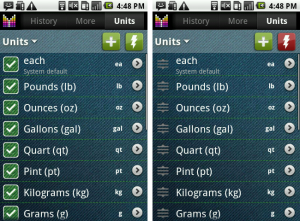 Configurable measurement units to add/change/hide measurement units and provide desirable increase/decrease rate. 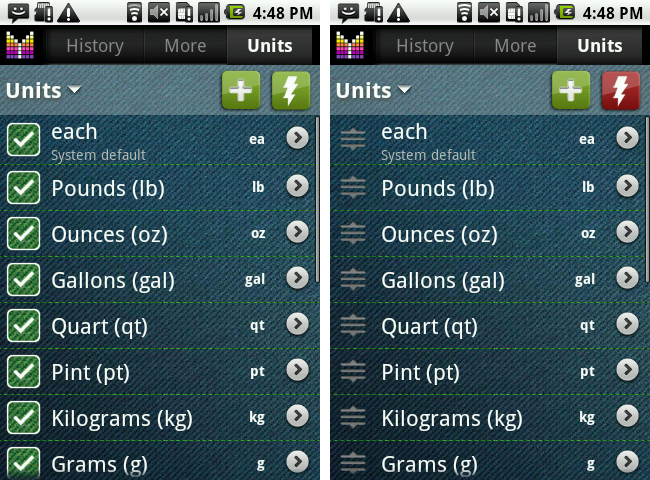 Just visit More –> Units and adjust units to your taste. 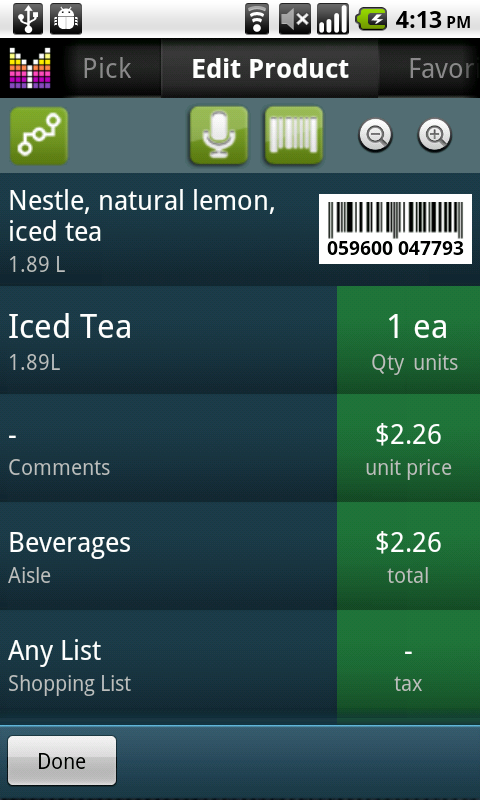 Also introducing a setting to show “1 ea” or “>” button in shopping list. 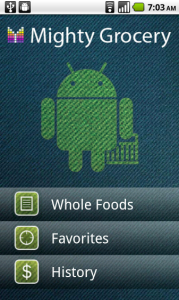 Disable screen lock/timeout in shopping list. To activate this feature, “Disable screen lock” setting should be set to On. Default value is Off to keep your phone safe. Full version only. Directions field in Recipes to keep cooking steps in addition to recipe ingredients. To access Directions field, click (i) on Recipe details page or click (>) next to a recipe on the list of recipes. List-specific Favorites. 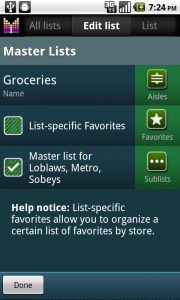 Shopping lists get a setting to configure individual set of favorites. Also, if favorites aisles were not customized, aisle configuration from parent shopping list will be used. Master Lists will group several shopping sub-lists and will allow browsing/shopping of all needed items from a single listing. Address item in several lists. If item is addressed in a master list, it will be displayed in master list and in every sublist if a sublist is browsed individually. Recipes to allow quick access to items you may need for your favorite meal. Full version only. 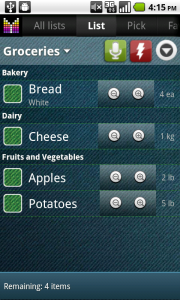 Lite version to allow 1 recipe for demo. SMS Share shopping lists, favorites, and recipes. Also may send via Twitter, Facebook, and other apps which support sending text. Configurable tabs. This feature allows show/hide tabs from the Tab Bar on top of the screen. Long-click on Tab Bar to quickly navigate to any page. Full version only. New Help page to contain features from More page like Videos, User’s Guide, etc. to make easier access to help information. More page to contain extra features, hidden from Tab Bar. Honest Discounts card built in the app. Free and ready to use. With this discount card you may save 10-75% off your prescriptions. Accepted by over 54K pharmacies in U.S.
No Ads setting in Menu –> Settings. Full version only. Other improvements of performance and reliability. Barcode Scan (Full Version only). Shortly: add item to shopping list by scanning barcode with the Barcode button which is available on the Sidebar. 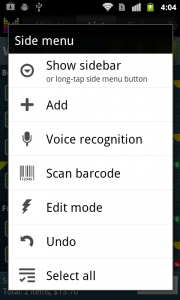 Long-press Barcode button to place it on Toolbar for easy access. Barcode is searched in the largest available online catalog of 1.3 million products plus products published by Mighty Grocery users. 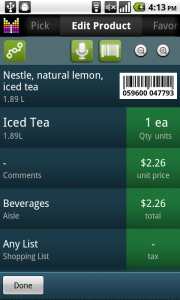 If there is no match for the scanned barcode, you can save product details locally in your app for future use. Also, you can publish new or changed product details so that other users would find the product after the suggestion is reviewed. Scan barcode on Edit Item Details screen to change product assigned to an item. Review all scanned barcodes at More –> Barcode Scans. 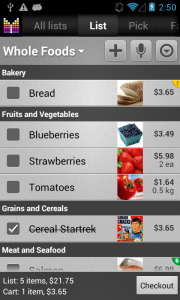 More details available in Mighty Grocery Shopping List Guide: Barcode Scan. Save item changes to Pick list. We’ve got lots of requests from people asking to store price and quantity into Pick list for later use. And now this is available for Lite & Full versions. During upgrade to Beta 8, the Pick list will be populated with existing data from Shopping Lists and Favorites (not from History). Later on, as you go shopping and update price/quantity, the changes will propagate to Pick list for future use. Pull data from Pick list — if item is added to shopping list by tapping Add button or by voice recognition, the data from Pick list will be pulled to the newly created item if match is found. Fixed unwanted field updates for added items. Better currency support. Allow to override locale settings by currency format pattern such as “$ %” or “% €” in Menu –> Settings –> Currency formatting. “%” is a placeholder for an actual amount. Save scroll position in shopping list. This allows to stay on the same item/aisle when rotating the phone on purpose or by accident. 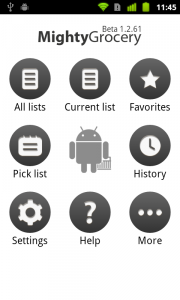 Replaced stars images on favorite list to be independent from phone’s design theme. Bugfix for adding over 10 items in details mode. Tax rate can now be provided for items in shopping list. Single click on “tax” field will iterate through available fixed options, long click will prompt for manual tax rate. Fixed options are configurable through App Menu –> Settings –> Tax Rates, where each line represents one of fixed Tax Rate (defaults are 0% and 13%). Currency sign ($, £, €, ¥) is taken from locale settings (Android Menu –> Settings –> Language & Keyboard –> Select locale). Decimal separator can be any symbol available on numeric keypad of your phone when prompted for price or weight. To display decimal value, either comma or point is used depending on your locale settings (see above). Pound Sterling and Pence are recognized as currency in voice recognition. I.e. if you say “Apples Two Pound Sterling Eighty Six Pence“, it will be recognized as Apples with the price of £2.86. Just a reminder, that “Dollars” and “Euros” were recognized in previous releases as well. Individual increase/decrease rates for an item can be changed with long click on increase or decrease button on Edit Item Details tab. Allow individual increase/decrease rate in shopping list (not only on Edit Item Details tab). Long click remains available on Edit Item tab only. Progress % of data migration from Lite to Full. Fix Xperia x10 (and other 1.6 devices) edit Force Close issue. Fix crashes after speech recognition on some devices. We had several reports of troubles upgrading from Beta 3 to Beta 4, though people solved issue either by reinstalling the app (eventually losing previous data) or by waiting until the issue mysteriously gone away. We assume that this is the same issue as described on Android Market support forum. The suggested solution is to reboot the phone (turn it off and on again). Though if icon still won’t work, it needs to be deleted and replaced with a new icon. If rebooting your phone won’t help, we will appreciate your contacting us at hi@mightypocket.com and we will make the app work for you again. Data migration from Lite to Full. 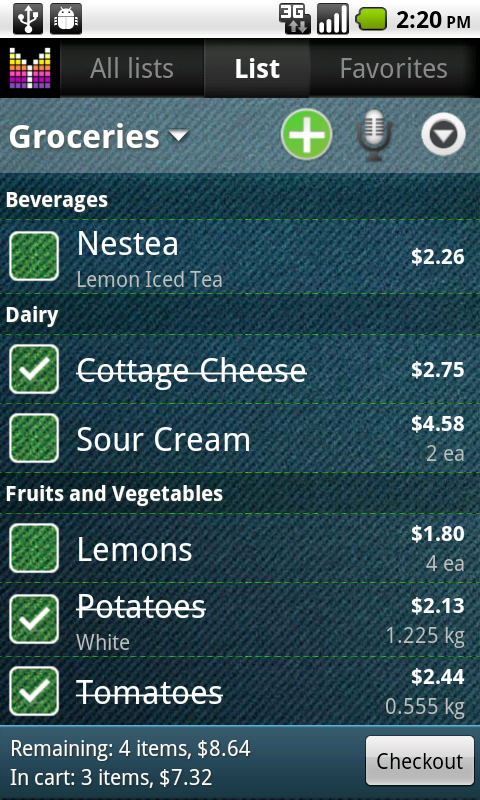 When Full version of Mighty Grocery shopping list is launched for the first time, it will check if Lite version is there on the handset. If it happens that existing Lite is Beta 4 and later, you will be offered to import all your data from the existing App. If you choose yes, all your data and settings will be copied to the Full version of shopping list. More tab. The new More tabs allows quick access to videos, User’s Guide, What’s new, the list of the upcoming features, and more. Design changes. 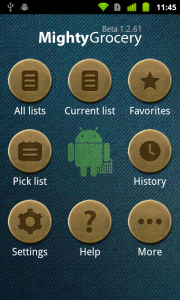 Lite version now gets a yellow badge showing “LITE” on icon, home screen, and More tab. Full version is free of any badges for you viewing pleasure. Show comments. Any item in shopping list may have a comment (also known as note). With this release the comment will show up on shopping list screen and a yellow marker will draw attention to the item with comment. Should you need less information on the screen, comments can be turned off from shopping list screen leaving only yellow marker as a reminder. Move to SD card. For happy owners of Android 2.2 handsets there will be no more problems with phone memory. 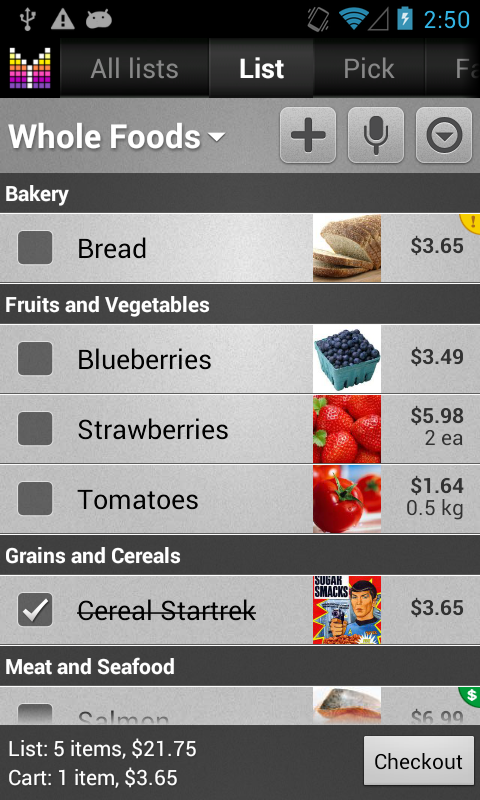 Shopping list app will be happy to live on your SD card to free phone memory for important data. Version on the home screen. 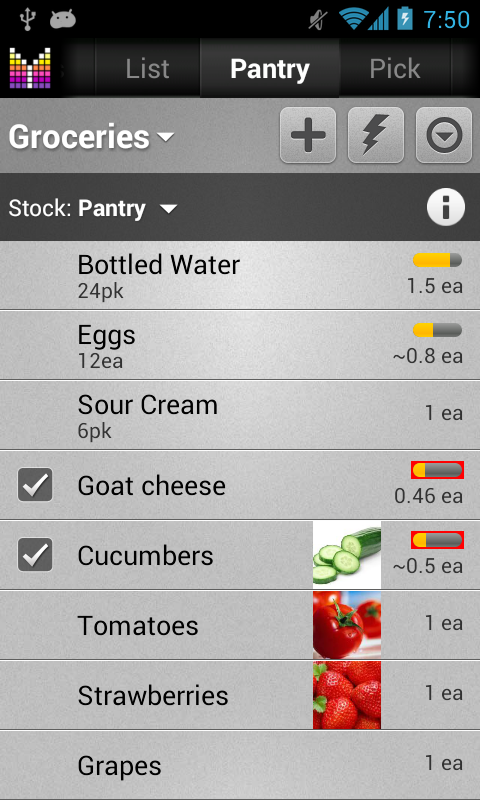 Never be confused again with the question what version of shopping list you have on your phone. The version information will always be available on home screen from now on. Improved performance. We put lots of effort to make Mighty Grocery run faster and smoother on slower devices. We hope you will enjoy jet shopping list performance. Minor fixes and improvements. We still are working on making experience with our shopping list a pleasure. Though some concepts like Pick list, My Picks and customized Aisles are pretty complex, your suggestions help us make the simple and useful. And we always here to listen to your suggestions. 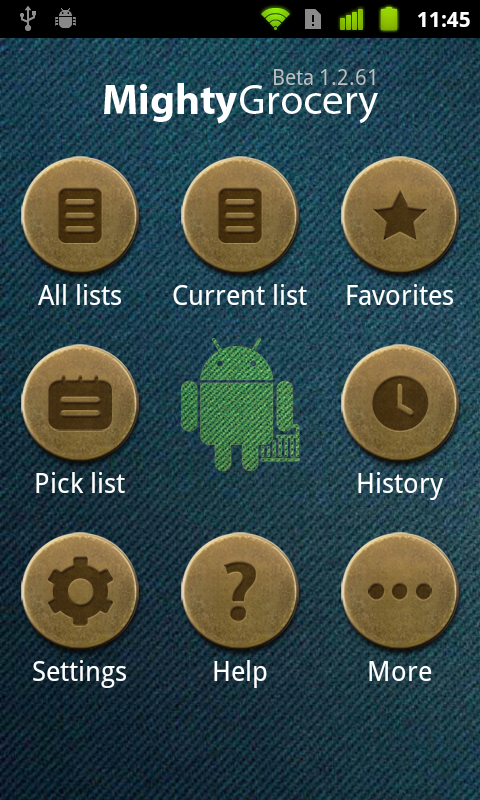 Fling Home Screen Buttons. 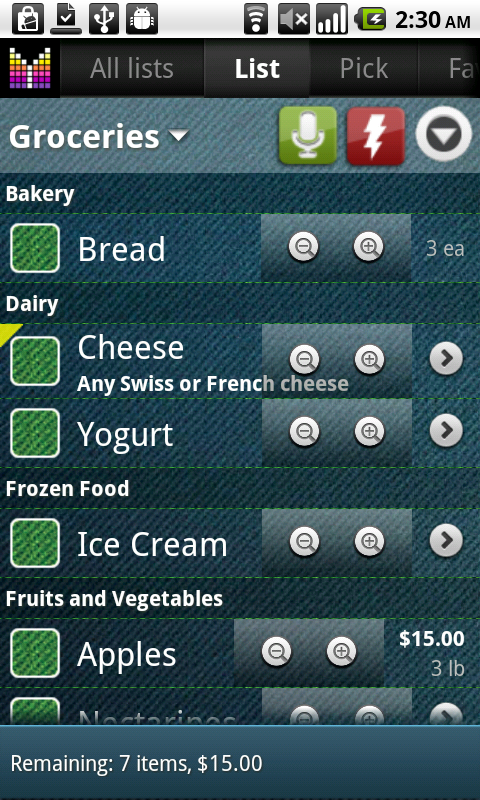 Ever wanted to customize home screen buttons to your taste to get to your shopping list in one click? Now you can. Just touch a button and move it right or left. It will get changed with another button. Add items directly to Pick list. 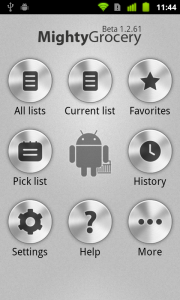 On the pick list clicking a button which looks like a gear will open “My picks” tab which allows adding custom items directly to pick list. 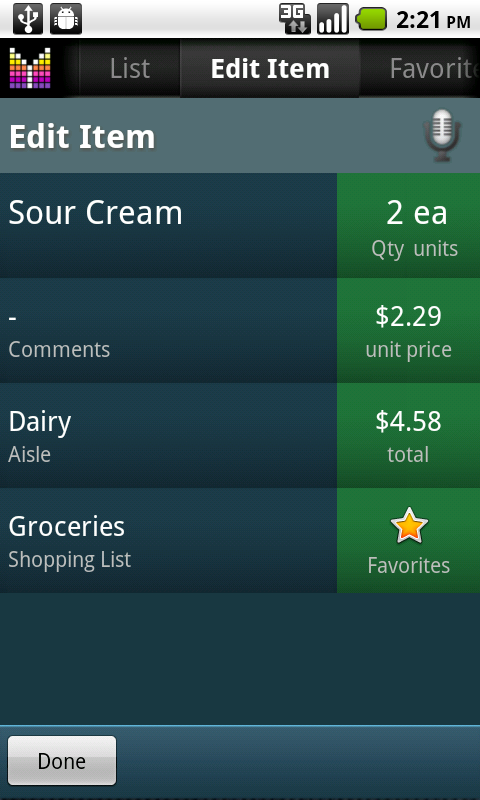 Earlier it was only possible to add items through a shopping list or favorites. Shopping list Edit Mode. On the side bar there is a button which looks like a lightning. When clicked it activates shopping list Edit Mode which allows quickly increase/decrease quantities or delete items from shopping list by flinging them. 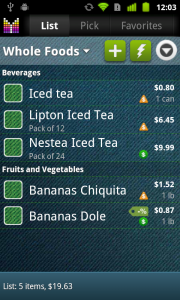 Increase/Decrease quantities is available in shopping list Edit Mode and on Edit Item tab. Seamless editing. Imagine you have “Apppples” on Favorites list. 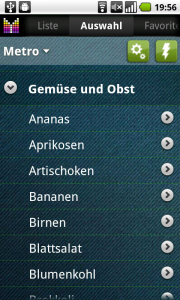 When you click it, the item is instantly created on the current shopping list. Now you noticed there’s something wrong with that item. Oh, boy. It’s misspelled. Seamless editing means that changing shopping list item name, quantity, price, aisle will instantly propagate to all items with the same name in all shopping lists and Favorites (except for History). So changing “Apppples” to Apples either in Favorites or in shopping list will now update both records. Should you want to change items independently — just click the link button (top-left corner) on Edit Item tab. Aisles. Mmmm. 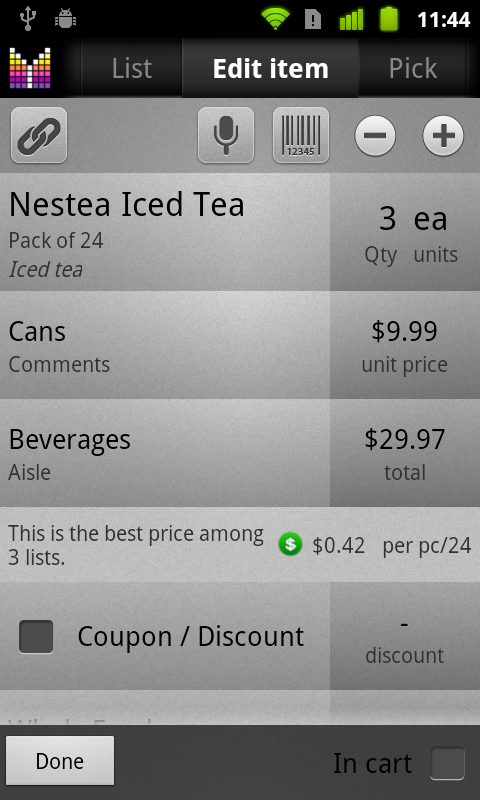 Now you can organize aisles in your shopping lists according to your tastes and/or store layouts. 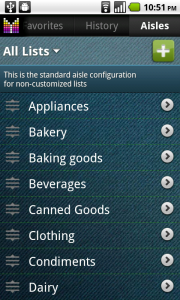 You may have different aisles configurations for different shopping lists. 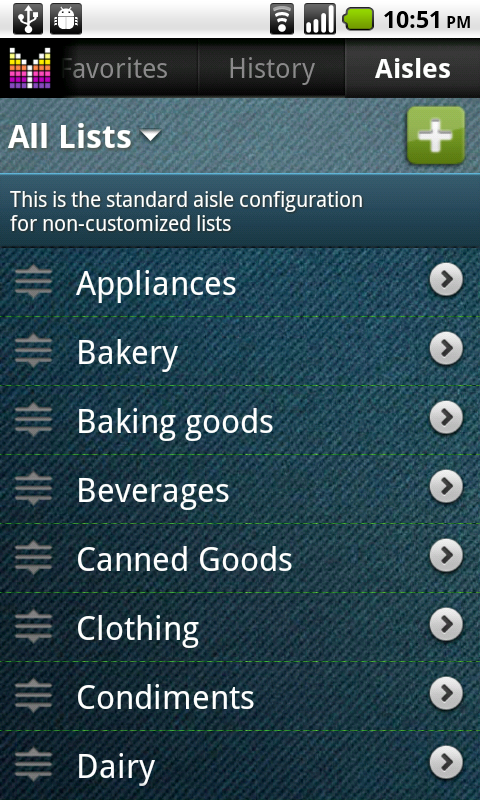 And you can change aisles name to the wording you like in shopping lists. Also you can change aisles order to match your store configuration during for improved shopping with Mighty Grocery list. Pick. Convenient catalog of products grouped by aisles. Click on aisle to see all items inside of it. Click on a product to add it to a shopping list. Yep, it’s that easy! Search across all items. 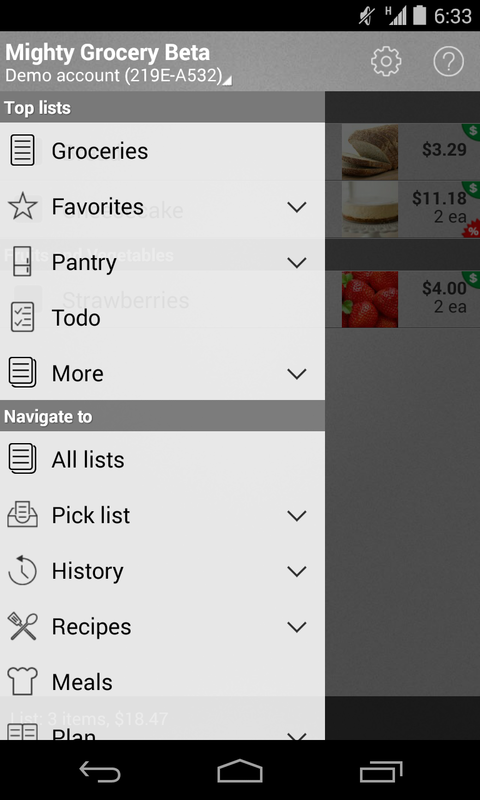 If you like adding items to shopping list using search and type, you will enjoy this feature. 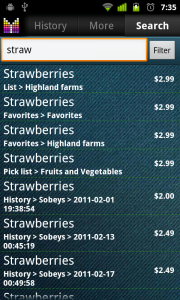 It posts shopping list items into product search catalog which makes them immediately available for your next searches. New command icons. 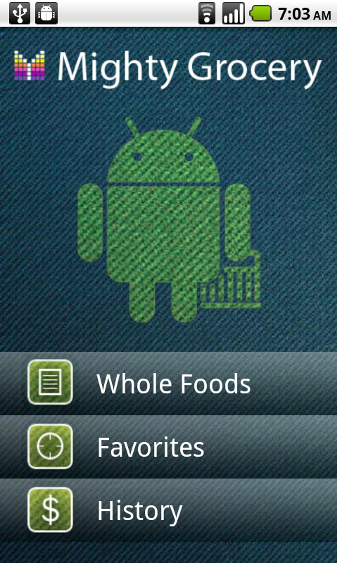 Shopping list and home screen get enhanced command buttons so you could enjoy even better design. Availability for Android 1.6. 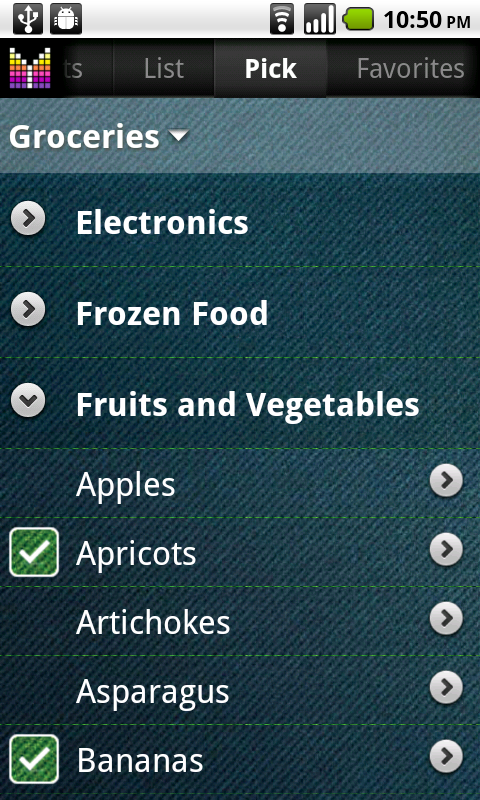 We initially did not plan to adopt Mighty Grocery Shopping List to Android OS versions prior to 2.1 due to a voice recognition feature we love so much. Nevertheless in the moment of curiosity, we ran our shopping list unit tests against Android 1.6 and they were all green except for the voice feature. So we decided to add Android 1.6 to the list of versions supported by our shopping list. 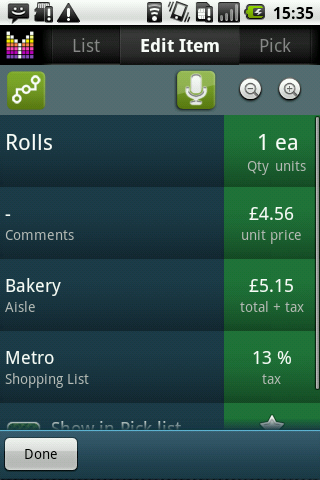 We believe there are enough great shopping list features in Mighty Grocery besides awesome voice recognition. Tabs on top of shopping list. Never get lost again and reach shopping Favorites with one click. 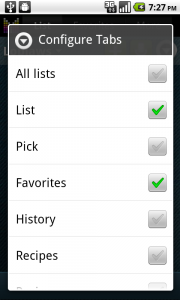 Though you might miss “Go to list” button on Favorites page, you can always switch to current list with a “List” tab. Sidebar allows to configure shopping list to your taste. If you long press Green Plus and Microphone buttons, they will jump from the main bar to the sidebar. If you open shopping list sidebar and long click one of those buttons, they will get back to main bar. Improved performance. We placed data update routines in background so you can enjoy a super-fast shopping list UI while data gets saved behind the scenes. Bouncing new items. Never have problems with locating just added items. They will keep bouncing in shopping list until you see them. Background tasks indicator. Will you guess where we’ve hidden it? Add items with voice: recognizes several items separated by “and”. Also understands quantity, units and unit price. Undo: never be disappointed with spontaneous clicks. Any 100 last actions can be undone. Add items quickly with keypad: over 350 records in Product Catalog which is automatically populated with Favorites and History. Favorites: one click adds your regular item to a shopping list. 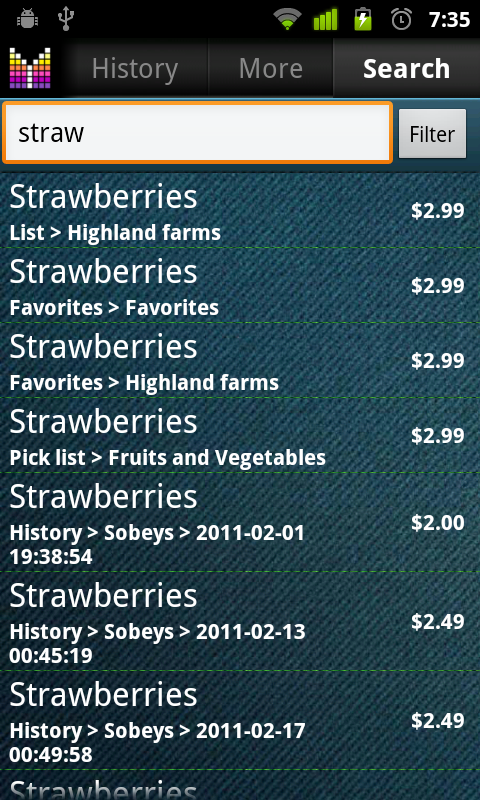 History: tracks history of all your purchases. It is so easy to make a copy of any purchase from the past. Aisle grouping: even if you say item aloud, its aisle will be extracted from Product Catalog. Share shopping list with anyone via email. Is there any way that the list can be printed out? I have a KINDLE and when I get to the store I wouldn’t be able to pull up the list. Do you plan to add wireless network printing as an option? Betty, thank you for contacting us. Unfortunately, we don’t have plans for wireless printing at the moment. But you may want to try printing shopping lists from My Mighty Grocery online account. For more details please see Sync with cloud User’s Guide. Great App thank you very much. 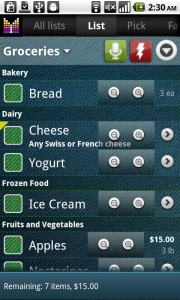 Is there a plan to put the Recipes in the cloud or allow syncing between devices? I’d like to be able to sync my phone which I use for shopping and my tablet, or even share one with a friend. Hi Ed, thanks so much for your feedback and your question. 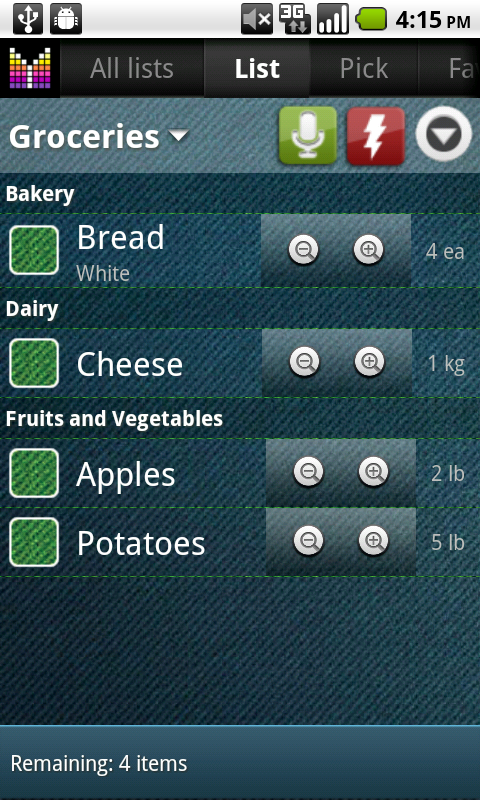 Kindly note that it is possible to sync shopping lists in Mighty Grocery using the Sync with Cloud feature. Unfortunately, syncing recipes is not possible yet. Hopefully, it will become available soon. Hello, thanks for this app, so useful! One question : is it possible to import or export lists? Hi there, thanks for your question. 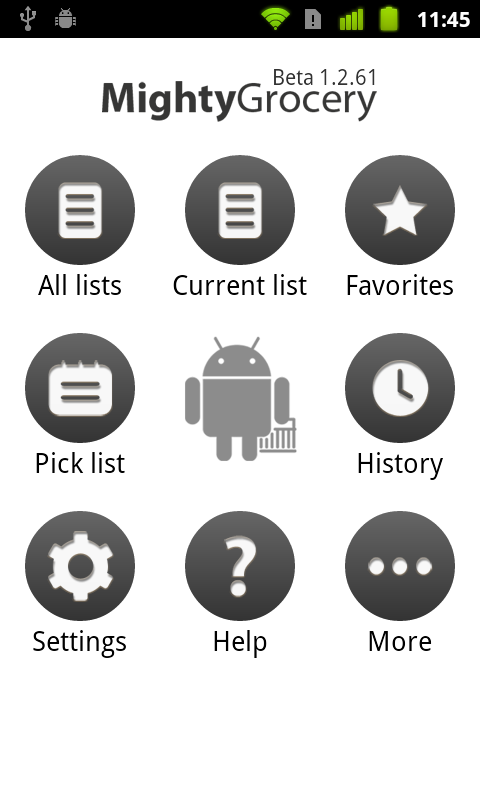 Kindly note that it is possible to import lists using Configure pick list feature. As for export, we plan on adding this feature in the future. Can coupon information be saved on phone (like save $1 off 2 items along with the coupon barcode info to let the cashier redeem/subtract amount from the grocery total)? Or can I scan a coupon and all its info is put on my phone justde like if I had it in my hand? Also, how do I enter a buy one get one free item? Hi Neka, thanks for your question. 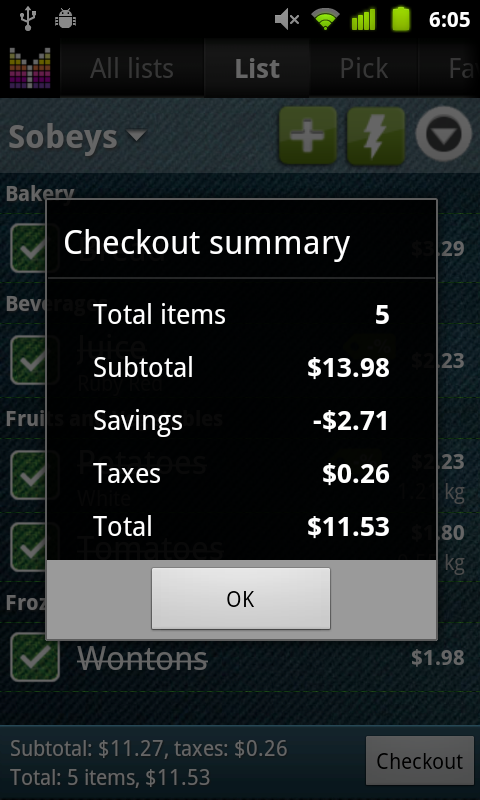 Kindly note that there is a Coupon Indicator feature in Mighty Grocery now. As for improvements such as scanning coupons and showing coupon barcodes to cashier, we are considering to add them in the future. Unfortunately, to enter buy one get one free item you will need to set price and quantity fields manually so that they would match the offering. Or you could set quantity to 2 and set coupon value to 50%. Thank you for your feedback again. This app was sooo worth the purchase! It really accelerated my shopping thanks to the aisle sorting. 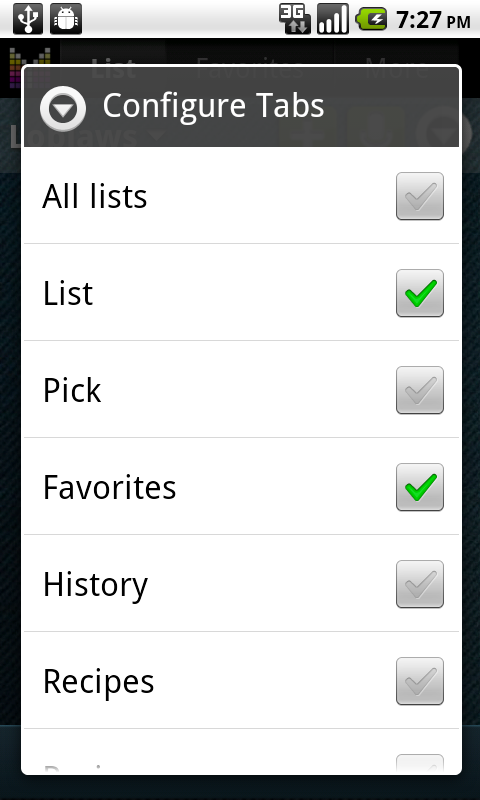 The syncing and the basic web ui makes it very convenient to change lists on my smartphone *and* on my PC. Way to go guys, hopefully the basic web ui will turn into a more advanced one someday (but I’m really happy there is one available at all, even if it’s just basic)! Roger, thanks so much for your feedback! I really appreciate. Hi Alex, is there new version coming? And what features it gonna bring? Hi Alexey, thanks for your question. Sorry for keeping you waiting for the update. Hopefully the new version will be available in a few weeks. Keep your eye on our Twitter to be the first to get the new version announcement. Currently, items sort showing capitalized items and then non-capitalized. Change this so that capitalization does not affect the sort order. Hello Tom, thank you for your suggestion. We will consider case-insensitive sort order going forward. For some,having Loblaws, Sobey’s etc. is nice. However,I’d like to have Busch’s, Country Market etc in the list and be able to remove your selections. How come I can’t edit this list? Peter, thank you for your question. You can add/delete lists as described in Multiple lists section of User’s Guide. You may also want to rename existing lists by clicking “>” on the rightmost side of a list. My wife and I love this app! Works perfectly on my Samsung Epic. Looking forward to all the upcoming features! Mel, thanks for the feedback!